MT: Elias Papanikolaou's Untitled: Iakovidis was the result of the artist's investigation in the issue of portraiture. His aim was on the one hand to create an artwork of classical standing, while on the other to combine the serious style with popular art. As known, Papanikolaou draws the inspirtation of his art by browsing through mass-produced magazines, of which he selects from an artistic viewpoint pictures that would come in handy for a collage. Thus he forms a world of images, which he appropriates as vehicles of colors and patterns. The procedure of art-making is for him an entertaining game, in keeping with words "as if it were my own fairground". This Untitled work began with the portrait of the classical Greek painter Georgios Iakovidis (1853-1932) in the center of the surface. The rest of the composition developed as something organic that rests upon this face, and depends on it. The collage includes a plethora of torn fragmentary images - such as photographs, advertisements, comics and abstract pictures - which have found their place aesthetically and conceptually. 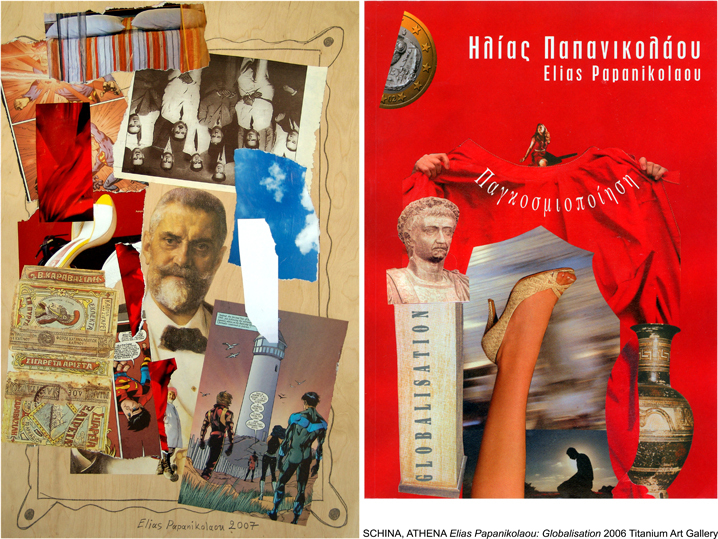 The old photograph placed up-side-down on top of Iakovidis' head is a direct expression of the mood for subversion that is typical of Papanikolaou's art. The inclusion of comics show the appetite for play that Papanikolaou wishes to convey through his work - a critic on the bilateral quality of life today, which composes a reality that is as much serious as it is comical. He also drew in a light manner on the periphrery of the work's surface a frame of classical type made in a loose but concentrated way, in order to problematize the seriousness of the central portrait. The artist's choice to allow stark sight of the background around the surface reveals his tendency to take advantage of the dynamics yielded by materials - in this case wood - in their raw form. With such respect for materials he manages to make the most of whatever they could yield. In closing, Papanicolaou seems to play with art, when in actual fact he treats his work with great seriousness and respect towards aesthetic.